We are constantly evolving technology wise and the niche it has created has made for comfortable living. The power of technology has created smart homes which have made simpler living more accessible. Need coffee? Switch on the TV? Regulate the temperature of your AC? You’ve got all that covered with smart homes. And, EBTL’s Amour is something different! Read below to find how what’s so different about this device compared to what we have in our industry today. Your mischievous kid will switch on the TV in his room the moment you step out of it! No more now, as you can schedule the switch connected to the TV to locked down for a specific period of time. That means no TV until the homework is done! Okay, so sockets aren’t really a safe place to play with. So, if your child is way too curious and you’re paranoid about him experimenting with sockets, you can simply lock it down with one touch from the app. That way, there’ll be no electricity flowing through the socket until authorised. That’s how you beat paranoia with tech. Apart from all these, Amour also lets you switch off all the connected lights and devices in one go. All you have to do is long press anywhere on the screen on the app. Amour is truly an Indianised solution. 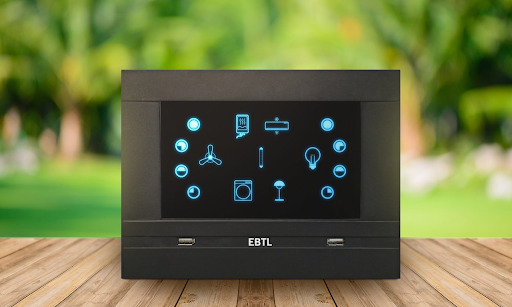 It can work seamlessly with an inverter and in case of a power cut, it remembers the state of the switches and restores the active devices back. The Amour panel can be retrofitted and does not require any special wiring. The panel is shockproof and can also be operated with wet hands! And with a similar operating system on the panel and the app, Amour makes simpler living easier to access. An emergency can come up anytime! There might be a situation where you’d want to reach out to your loved ones. And Amour makes this easy with its SMS SOS functionality. A designated long press on the screen of the Amour panel sends out an SMS to up to 3 specified contacts. Stay connected, stay safe – with Amour automation. Are you on a lookout to upgrade your home into a smart home? Go ahead and book a consultation with us right away. Our consulting service is free and we can help you find out the right brand which fits your home.